Although I have been enjoying the pumpkins and winter squash a lot lately, I was ready for a bit of a change and that got me to thinking about other fall produce that I enjoy. Pears are one that I have regularly but I rarely seem to use them in recipes and now was the perfect opportunity to do so! I still needed something for breakfasts for the week and that reminded me of the pear and gorgonzola omelette that I had enjoyed so much last year and I recalled thinking that it would also be nice in quiche form at the time. I simply could not resist the idea of using one of my favourite flavour combinations, pear and gorgonzola, so I had my breakfast idea, a pear and gorgonzola quiche. I figured it would not be all that fun to be biting into your light and fluffy quiche only to hit a rock hard piece of pear so I wanted to cook the pear a bit before putting it into the quiche. There are a few ways to do this and although poaching the pears crossed my mind I went with a simpler solution and I just sauteed the pear in some butter and brown sugar until tender. The sweetness added by caramelizing the pears like this goes surprisingly well with the pear and tangly gorgonzola combo in eggs. Next up, I wanted something salty to balance things out and diced pancetta sounded like they would do the trick nicely. I also wanted to work a nut into the quiche somehow but I did not like the sound of biting into nuts in a quiche so I decided to replace some of the flour in my my all butter crust with ground walnuts. The caramelized pear and gorgonzola quiche turned out amazingly well! The pear and gorgonzola flavour combo proved once again why it is a classic and it worked really well in a quiche. Caramelizing the pears first added a nice hint of sweetness that was balanced by the salty pancetta. Most of all, I really enjoyed the way that the ground walnuts worked in the butter pastry crust and I will definitely have to remember to try adding nuts to future pie crusts like this. Cook the pancetta and shallot in a pan. Add the sugar and cook until bubbly, about 3 minutes. Add the pear and saute until tender, about 3-5 minutes. Mix the pears, eggs, half and half, thyme and gorgonzola and pour it into the pre-baked pie crust. Bake in a preheated 375F/190C oven until golden brown on top and set in the center, about 25-45 minutes. Pulse the flour, ground walnuts, salt and sugar in a food processor to mix. Add the butter and pulse until the mixture resembles a coarse meal, about 6-8 times. Add a tablespoon of water at a time pulsing in between until it starts to clump together. Place the dough on a clean surface and shape it into a disc. Wrap the dough in plastic and refrigerate for at least an hour. Roll the dough into a 12 inch circle about 1/8 of an inch thick on a lightly floured surface. Place the dough into a 9 inch diameter spring form pan with the edges going up the side of the pan. Place a piece of parchment paper in the pie and fill it with rice or beans to hold it down. Bake in a preheated 350F/180C oven for 15 minutes. Remove the parchment paper and weight and poke the bottom of the crust with a fork a few times. Bake until a light golden brown, about 10 minutes. Looks fabulous as usual Kevin! Inspirational, as are your pictures! This is an elegant stunning quiche! It says fall, and looks so good! Wow, fruit in a quiche! I would *really* love to taste this, the combination sounds so interesting. It looks just beautiful! Did the gorgonzola overwhelm the delicate taste of the pear? I love that you cooked the pear a bit first. I have had too many unhappy surprises with pears that turned out to be not quite ripe. That said, you are making me rethink my efforts to lose the blogger pounds I have gained because I want the quiche. You have such interesting recipes. Don't know if I posted, but checked out your appetizers and got several great ideas. The colours of the combined ingredients are tantalizing. Your recipes keep getting better and better my friend! 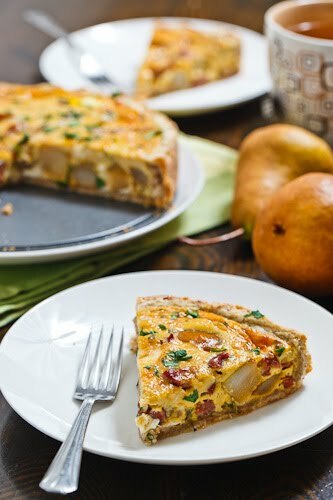 A good quiche gets my vote any day, Gorgonzola and pears area perfect combination…..this is pretty much a perfect quiche then!! This looks absolutely divine! At the restaurant I worked at, owned by Chef Daniel Lindley, we served a pear, gorgonzola, and prosciutto pizza sprinkled with a little fresh arugula… YUM! So I can only imagine how outstanding this must be! Forgive my ignorance, but what do you mean by "half and half"? I love this combination! And lovely photos, too. A terrific combo and quiche! So delicious! I love pear and gorgonzola together . . . 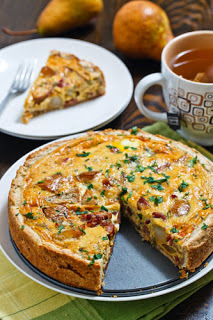 Superb looking quiche – it looks like what my husband and I would call a taste-explosion. Super yummy. This sounds like a quiche worth craving! And those are not easy to come by. Carole: The pear and gorgonzola combo works well with the sweetness of the pears balancing the tang of the gorgonzola. If you are not the biggest fan of blue cheeses you can easily cut back on the amount of the gorgonzola. Kevin, I skipped lunch today … after reading your recipe I'm hungry. 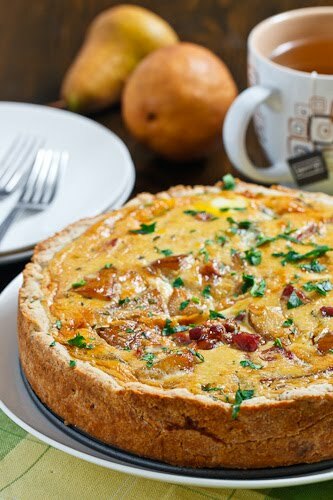 This sweet/savory quiche looks like an amazing addition to any holiday table! wow, what creative ingredients for a quiche! looks delicious! Ta Kevin, thanks for the info – might have to try this out over the next week or so! Yum! Cheese and pear is one of my absolute favorite combinations. Sounds like a delicious crust too. Hi, I'm an italian foodblogger with passion for baking. I do not really love to eat pears with cheese, even if it's common in some areas in Italy. Anyway your blog is full of interesting recipes! By the way, I have a question: do you buy italian gorgonzola? 1. What is the green stuff in the photo of the quiche…I don't see anything green in the recipe? 2. I am not a fan of blue cheeses. What cheese do you think I could use instead? Wow! This looks amazing!!! Pear and gorgonzola sound like a great combo. You are keeping me busy with recipes I have to try. I love food that combines fruit and cheese. Am making your tart this weekend as a trial run – I plan to serve it New Years Eve. CHARMAINE: 1. That is just a bit of chopped parsley that I added for some colour in the photo. 2. A goat cheese or a strong cheddar should also work well in this quiche. Wow looks fabulous! I think I just might have to make this for brunch this weekend for my friends! Elly: I try to get Italian gorgonzola whenever I can. Wow, I think it is not easy to find real italian gorgonzola. I love it, I often have it with nuts. First time commenter – long time lerker. I love the idea of Gorgonzola in a quiche – which I happen to be famous for making. I can't wait to try this! Brilliant Kevin. Love this idea. Normally, I'd say pear and gorgonzola???? Ick!!!! But I made SippitySup's baked pear and gorgonzola salad a few weeks ago and WOW! What a great flavor combo. Looks beautiful and sounds delicious! Your blog posts are always so professional and beautiful looking. Love reading, keep up the good work! Oh, my! This looks amazing. I wish I could have a large slice for dinner. Anonymous: I used a 9 inch diameter spring form pan. This quiche looks and sounds incredible- I'm having a slew of guests over next weekend for brunch and would love to make it. How would you suggest doing so ahead of time, making use of my freezer in the meanwhile? I want to make this for a brunch I'm hosting with a rather large guest list. I want to get a jumpstart and make it the night before – when in the process should I freeze it, and how should I reheat it? Anonymous: I have not tried freezing a quiche before but I have heard that you can freeze them either before or after baking. I would suggest freezing it in the pan just before baking and then either thawing it in the fridge or putting it in the oven frozen and allowing for an extra 10-20 minutes of baking time. Kevin, I just cook the quiche …. and this is absolutely delicious! thanks for the recipe! Hey kevin! Are you married? If not I think we are a match made in heaven …… As long as you are prepared to live in the best place on earth. It's about the food, it's about the weather, it's about the scenery but most of all it's about the passion and food…. Come and live in Australia and we could have sooo much fun together!! i want to make this but what is '1 cup half and half' in the ingredients sposed to be?? Anonymous: Half and half is a milk and cream mixture that generally comes with around 10% milk fat. You can replace it with your own mixture of cream and milk or with all milk or all cream. If this recipe doesn't sound and look good, I don't know what does! You showcase the BEST recipes on your site, which is why I'm back — yet, again. Great post. Thank you… I can't wait to make it. Having people over and I'm sure they're going to LOVE it! Walnuts in a Pate Brisee? Quiche in a spring-form? Brilliant and inspired! This was so, so good and I'll definitely make it again and again and again. Had to use tempeh bacon in place of panchetta but it was really good none the less! Made this for dinner tonight. Love the sweet, salty ingredients and the unique combo of flavors. My crust shrunk a bit, so I baked leftover filling mixture in a ramekin and had an extra crustless quiche 🙂 Thanks for the great recipe. I made this quiche for my daughter's bridal shower brunch. It was one of the most delicious quiche recipes EVER. The sweet/savory flavors were perfect. Thank you for the recipe! I have made this recipe into small appetizer tarts and they are delicious. Can u make this the night before and cook it in the morning? WIThout crust?